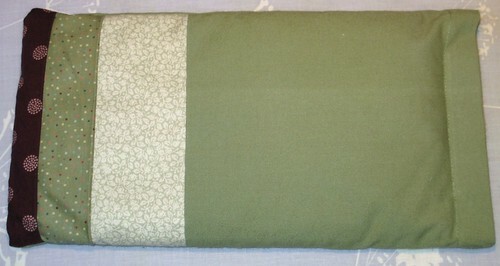 For my dad’s birthday gift, I made a hot/cold flax seed therapy bag from a Sew, Mama, Sew tutorial. I think patterns are difficult for me the first time through, because I’m not conversant with concepts immediately obvious to anyone with, as Barbara says, “basing sewing under your belt.” If I hadn’t repeatedly screwed things up, it wouldn’t have taken much longer than an hour to put it all together, start to finish. First, I cut the fabric wrong no less than four times – mostly because I had to walk over to the computer, then walk back to the sewing table, and the numbers got jumbled up in my head. Then the machine kept stitching funny. But in the end, it all turned out alright. It can be safely microwaved or frozen. I may have to make one of these for myself! This is really beautiful! I am sure he will love it!